on the sunday before the weekend climb, i received SMS from niel asking me if i would be interested in joining his group, as everyone else had unceremoniously backed out for one reason or another. my initial reactions were: was the offer first made to me? and who are the trainees? i had already settled in rather well with bossing's group, and we had everything all figured out, but here was a batchmate in distress. so i figured, as long as we have meat on the menu, then i'll make the move. vince had earlier informed me that he'll be joining me, so at least niel was assured of the support of at least 2 members. so after a rushed wednesday pre-climb, it was all systems go for malipunyo. i had no doubt that my team was going to be well-prepared for the challenge. niel had placed a challenge on the table: he'll be treating us to a post-climb dinner in any restaurant if we don't do any night trek on both days. it seemed like a really good incentive to manage our rest stops well. but, there's a catch, of course, it was any restaurant with vegetarian food. even before the climb, i was suggesting circles. as usual, assembly was at ayala. we had a bus and a van. we picked up niel along SLEX, and reached the jump-off a little late. being group 1, we trailed the lead pack closely. 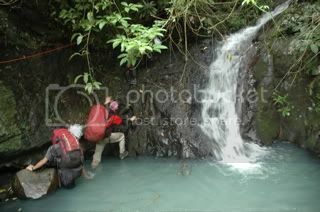 the trek started on a dirt road that ended very suddenly at the foot of the mountain range, where leaves the size of modest umbrellas, and ferns almost competing with coconuts rose from the ground. a small stream appeared. the water was milky, in a way, and it slithered around slippery moss-covered rocks of all sizes. it was pointless to avoid getting your shoes soaked. wading through these shallow cloudy waters seemed inevitable. 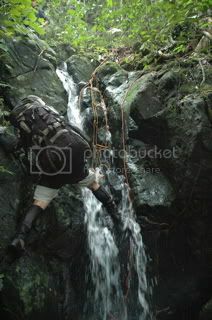 a pipe ran alongside the stream, and i wondered whether there was an easier way, rather than clambering up rocks. eventually, we arrived at the first obstacle. a steep wall of pure, jagged rock, probably 12 feet tall, stood above a small pool. its texture resembled books carelessly stacked on top of each other. a rope had been affixed to assist us, and there were a few footholds here and there. water ran parallel to us, and sam was thankfully present to pull us up. after my turn, zaza came next. but her foot slipped, and she slammed her knee on the wall. free rock-climbing would be the order of the day, as similar obstacles presented themselves along the way. while this wasn't nearly like the japanese garden of mariveles, the challenges were sufficient to make the climb a lot less dreary and boring. the next challenge was a little more daunting, as it involved scaling the water line. rope ladders had been placed exactly where the water fell, and upper body strength accounted for getting past it. it must have been a little more than 15 feet. once on top, water that fell down a big, vertical rock like a beaded curtain provided some opportunities for photography. i instructed some of my companions to make yoga poses. 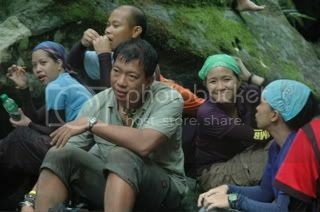 i was a little reminded of the pic i had taken at the papaya river in tarak ridge. 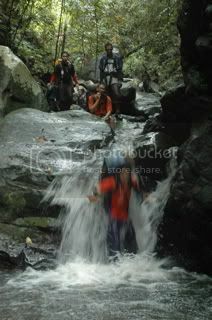 this would be the last of our water trekking for the day. the trek was very steady, and we were informed that insofar as our group was concerned, we were far, far ahead of the itinerary. by at least 3 hours. our group closely trailed the lead pack, even as we were taken to the area that had been described as the nampucha trail. before long, we had reached the first peak, where we had an early lunch. i munched on a burger from jollibee. the other groups followed not long afterwards, but as they started eating, we picked up our bags and resumed the trek. 3 hours ahead or not, we weren't taking chances on our free dinner. 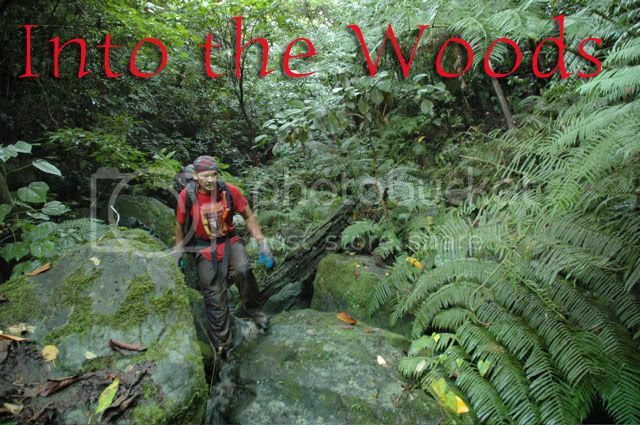 the trail wound through the lush lowland forest that had all sorts of plants and wild orchids. the ground was lush with an assortment of greens and insects. i fell and slipped on occasion, but never before have i fallen so many times only because the tree or branch that i held on to fell with me. before long, the trek became more or less routine. putting one foot ahead of the other, holding on to something to prevent a bad fall. but the variety of things to see, and the escalating difficulty of the trek, chased away the prospects of boredom. nevertheless, once we were past sky's window, and were at the last stretch of the trek, an unnerving feeling came upon me. it felt as if i had been there before, as if i had been going around in circles. the feeling is not supernatural in nature, but one brought about by sky's reputation. it really did feel that we weren't subscribing to the rules of geometry. but then, that's sky. by the time i reached the saguingan, i got extremely bored and tired. it wasn't physical exhaustion, per se, but a frustration over the route we were taking. what does it profit sky to be going around in dizzying circles? since i paced the group, i called for a 5-minute break in a clearing. niel insisted we were maybe 20 minutes from the campsite, but we lingered there nonetheless. we'd managed our stops well, and i received few complaints from my trainees, despite going on without rest since 2 hours previous. 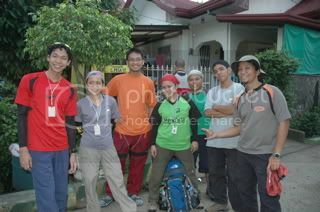 when we pushed for the final stretch, we entered a dense cogon area, where blades of grass swayed high above our heads. it felt like i was in a horror movie. niel was wrong, after all. because we reached the campsite in about 5 minutes from where we last rested. we were there at exactly 3.30pm. almost 3 hours ahead of IT. the remaras campsite resembles lamot in that it is a field of cogon. in order to pitch a tent, we had to trample on the grass, and make a clearing for our campsite. we pitched a little farther away from the lead pack. 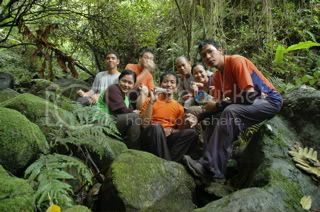 after a while, bossing's group arrived, and they set-up camp just beside us. because a fence of cogon blocked our view, we weren't sure if any other team was arriving. little did we know that some of the groups weren't even complete by the time we'd started on dinner. niel whipped up a mixed veggies dish, while i experimented on beef with black bean garlic sauce. both were very good. after dinner, which we finished early, we were talking about the socials presentation. i, for one, was very very exhausted from not having had an hour of sleep since friday morning, so i said i'll just sneak in a nap. then may came along to announce that there will be no socials presentation. all of a sudden, the vodka appeared, and the regulars were in attendance. while other groups were still busy with preparing dinner, we were already trading stories. genie visited our campsite and she poured vodka for all of us. i manage to goad sir manny into talking about his near-death experience at the basecamp of mount everest. i also elicited stories from marc about his scar, and about his ties with jomen (which is still pretty incomplete). when we finished the sky vodka, we simply went where there was alcohol. sir manny had just moved lights out to as late as 11pm, so we had time to go around. 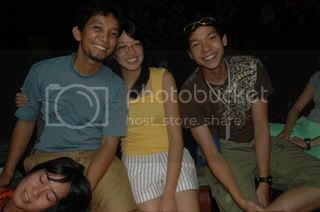 we moved to other groups, and i was pretending to be very drunk, when i was only a little tipsy. 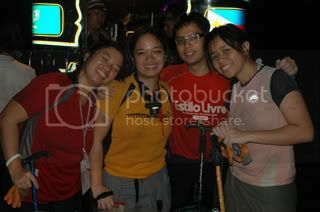 after mawi gave me my last drink for the evening, i almost literally crawled to my tent. i must've slept well that night, and woke up at the sound of the bell. "2 minutes", i faintly heard zaza say, and i opened my door. adonis was already up, and i saw that our parawing had survived the howling winds of the previous night. it was now time to prepare breakfast. we'd planned on skinless longaniza and for lunch, pesto pasta and fried chicken -- a perfect combination. we were barely finished with the longaniza when it started to rain. i am well acquainted with rain during climbs, but this one was ridiculous. the amount of rainwater that poured wasn't quite the clincher. it was the furious wind. it had a desire to take us out of the mountain. i quickly fetched my cheap 20 peso poncho and gave instructions on what to cook and how to operate my stoves. 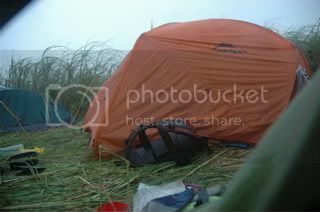 so while the trainees busied themselves with breakfast and lunch, i went inside my tent, and began to pack. by the time i had rolled my thermarest, the rain hadn't stopped yet. so i went out again, changed into my trekking pants, and continued to stuff my bag. all that was left to do was eat breakfast. i stood out in the rain waiting. by 6am, we were all finished eating, which we all did in a hurry. the rain paused briefly, and i made the mistake of stuffing my poncho deep inside my bag. but when the rain resumed, i had fixed nearly everything, save the tent. 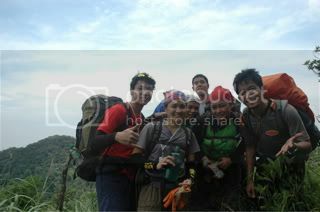 bossing's group was also in a hurry to pack, but niel and i encouraged our trainees to finish ahead of everyone. so by 6.30, we'd loaded our packs, and proceeded to the lead pack's camp, where we half expected them to be already impatiently waiting. much to our surprise, they were still there, gingerly eating breakfast. and us, well, we were left feeling the wind and the rain. it took the lead pack another 30 minutes to pack up, which meant i was exposed with nothing save the orange salomon shirt on my back. i was moving around, trying to feel warm, wondering why, by this time, some groups were still busy cooking. i wondered whether we were non-recipients of some bit of news. we finally gained some ground at 7am when sir manny and sky left the campsite. the rest of the lead pack followed shortly, and we were close behind. we took the trail to the banana plantation once again, and an innocuous bend marked the start of that 10-hour trek to laguna. it started out really steep and really slippery, with some dangerous drops. we were cautiously descending down a gully, and i had occasion to explain to ai and zaza what this part of the mountain would've looked like if seen from a topographic map. we moved slowly, and didn't quite stick to the 5 minutes for every hour of trekking rule, until we found an area that seemed like a good place to munch on trail food. little did we know that 2 minutes ahead was the lead pack. it was a long stop, where we waited for other groups to arrive. shortly after we arrived as one team, the group led by francis came in trickles. then bossing's group arrived, one member at a time. it was just a little past 11am, and sir manny said that all the other groups will most definitely be doing a lot of night trekking. then sky pointed out the exit through the horse trail. i didn't even consider it. 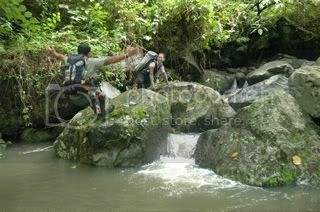 one of the reasons i participated in the climb was to feel every painful hour of river trekking. and of course i'd heard of the back dive. shortly after we left the head of the river, we reached what they called the slide. 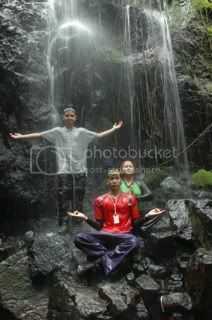 they instructed me to loosen my hipbelt, sit at the top of the rock, and just let the waterfall push me down. i fell on navel-deep waters without submerging my head. then others followed, and following tradition, each one of them performed the slide. the pool where the slide poured into was decked between a small gorge with nearly vertical walls on either side. since it was a quarter to 12, we decided that it was a nice place to have lunch, while awaiting the others to perform their slides. after a quick, 20-minute lunch, we resumed the trek. the gully where the water started as a trickle, then gained momentum as a stream and collected as a small river is a winding stretch of rocks of all sizes. on either side are usually steep embankments with lush growths, that wading into the water seemed the only way to go. there were times when i had to subject myself to the indignity of sliding myself down a rock, since the water didn't quite allow me to gauge if it was deep, or if anything, like spikes, or rocks were underneath. at times the stream poured down gently, with a number of rocks exposed here and there. but at times, it tumbled down with force. since i had to slide down many times, my backpack cover would come undone, and adonnis, many many times, would say, "alman, your backpack cover." even he could not escape the english-speaking virus that had infected our group. even medi fell victim to the scourge of the outbreak. it got so bad, that very early on, we were being described as the call center group. after a while, we came upon the back dive area. it must have been the deepest part of the river. i assumed the position, turned my back around, and said a spiel about greg louganis. then i asked zaza to push me, but she wouldn't. so with some trepidation, i plunged myself, backpack first, with arms outstretched, down to the pool. this is where i took my last picture of the trek. since not once, between here until the road, did we stop longer than to figure out what we were to step on. i only felt a bit of fear when i went down the pipe, not able to see where to put my foot. towards the end of the river trek, adonis and i came upon a big rock, and a pool, about 15 feet below it. it was higher than the back dive and the slide combined. we wanted to jump, but were uncertain whether anything in the water would hurt us. after vince inspected the water with his stick, adonnis jumped first, and i followed. of the 70 climbers who took the route, i think only the two of us had been foolish enough to even consider the jump. so foolish, that even zaza didn't dare look. after we emerged unhurt, i saw in the distance, a post carrying wires. "highway!" i screamed, and shortly thereafter, the last of the trailsigns on the river, pointing to a muddy path to the left. it was just after 5, and we were beginning to celebrate our arrival before cover of darkness. 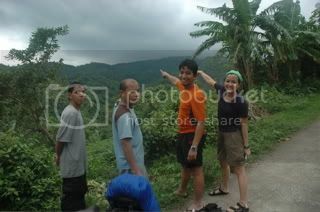 when we reached the road, up ahead, i saw bajay and jay tongga. it crossed my mind: had we been fooled, and all the other teams took the shortcut? it turned out that michelle had injured her knee, and needed 2 sweepers to guide her through the exit. we'd just been trekking for the better part of 10 hours. this was my cue to break down. or to celebrate. but i could not do it. other than myself, vince, and zaza, the rest of our group was still nowhere in sight. we waited. patiently at first, when stragglers from various groups arrived one after the other. each one of them we asked if they'd passed niel along the way, and they said yes. i began to doubt whether niel was intentionally delaying reaching the road while there was still some light so he wouldn't have to take us out to dinner. i began to worry when it was 10 minutes to 6, not so much for their safety, but for the free dinner that just slipped my hands. then, a stroke before 6, and without taking out their headlamps, the last of our group arrived. we ordered the jeep to take us to the wash area where we had chicken arroz caldo and a soda. i took a bath outside, under a coconut tree, behind the tents left to dry. by 6.45pm, i was already offering beers to the lead pack. before long, we had purchased and imbibed all the 4 grandes available, and focused our attention on other liquors, like the grand matador. jomen started concocting drinks, then passed the role to TJ. but goodness. it was already 10pm, and only 3 groups had been completed. i couldn't help but wonder how they endured the hours after sunset. trekking in daylight was already difficult to begin with. how much more in darkness? apparently, GLs were given instructions to stay put and bivouac at the stroke of midnight. then, at 11.40pm, cheers resounded as the last jeepneys arrived, loaded with the last remaining groups. some of them still managed optimistic smiles. others appeared too tired to even answer questions about how they were. the malipunyo climb, much like the mariveles experience last year, will dictate, quite accurately, who among the trainees are likely to be seen in the succeeding TDs. if you survive this ordeal, you're likely to survive nearly everything else. the climb was a test, not so much of skill, but of dogged determination. the end of the trail is somewhere there, up ahead in the distance. whether you break apart in the process will depend on how prepared you are, physically and mentally, for the difficulties. for my part, i was more than happy to have found myself in a group of strong-willed individuals: persons not afraid to fall, who put one foot ahead of the other, with caution, but with confidence; persons not guided by fear, but by the wisdom that crying before getting hurt will not likely make anything less painful.